So, samphire duly purchased at my local market, what was I going to make with it? It works really well in a salad, especially wilted slightly, with pickled ginger and sesame. I also had some beet greens though so I decided on cooking up a samphire storm and making a flan. I think technically this is a tarte, in the tarte tatin fashion, in that you cook the filling on the hob, lay the pastry on top of the dish and pop the whole thing in the oven. Whatever it’s supposed to be called – tarte, flan, pie, upside down dinner thing – it is very, very tasty. It looks and tastes fancy but it’s easy to make, making it a great dinner party dish. Why spend all your time in the kitchen when you have friends to chat to?! The cashews give it a little protein kick and the beet greens are high in A, K and B-complex vitamins, making them particularly useful for vegans. I used ready-made flaky pastry, mainly because I don’t have what my friend, Cathy, calls ‘pastry hands’. Do you remember making pastry when you were a kid and it turned all grey and rock hard? Many years on, my pastry still looks like that so, as someone who appreciates her food, I always buy it. I’m not often defeated but I accepted long ago that I was never destined to be a pastry chef. You’ll need to cook this in something that’s suitable for both the hob and the oven to cook the filling in. (I used a cast iron pan). If you don’t have anything suitable, make the filling and then transfer it to an ovenproof dish or flan tin before you transfer it to the oven. 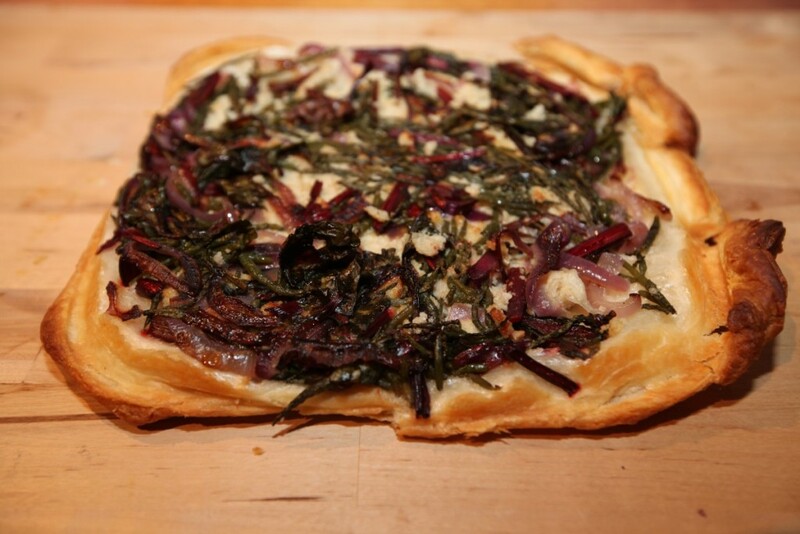 Samphire and cashew cream flan with beet greens and red onion. Pre-heat the oven as directed on the pastry packet. First, place the cashew nuts in a jug and add enough hot water to only just cover them. Warm the oil in an ovenproof dish over a medium heat and add the red onion. Cook for 5 minutes. Add the beet greens or chard and cook for a further 5 minutes, stirring occasionally. Add the samphire and cook for another 2-3 minutes until it starts to wilt slightly. Remove the ovenproof dish from the heat and place it on a baking tray. Now buzz the cashew nuts and water together with a stick blender or food processor to make the cashew cream. Spoon the cashew cream over the cooked vegetables, pushing it out to the edges so that it reaches the sides of the dish. Very lightly oil the rim of the dish (this helps to ease the pastry away when it's cooked). Lay the pastry over the top of the dish, leaving the edges a little loose and ruffled. Place the baking tray in the oven and cook for 20-25 minutes (or as directed on the pastry pack). Allow the flan to cool for a few minutes after taking it out of the oven. Gently turn onto a large wooden chopping board, teasing the edges of the pastry away from the rim of the dish if necessary.